Sometimes my path crosses with a somewhat hairy male. Or hairy female, that’s possible too. Often they are unwelcome anymore but lucky fort hem they’ve found a new home. But still, they carry a heavy burden on their shoulders. Their history follows them wherever they go. The rejection, the fear, to be abandoned, unwanted, they’ve lost their safe heaven, their basis, all kinds of trauma that make them respond a little bit different than they normally would have done. Often scared and edgy it influences the lives of them and their new found owner because it’s hard to enjoy live and love unconditionally when you’ve lost it all once before. He’s called man’s best friend for a reason. And when you’re no longer welcome in your best friend’s house, it really hurts and you miss him dearly. When a new dog owner visits my practice and tells me about his new pet and I sense that it’s traumatised, we’re quick to make an appointment and do a real ‘dog healing’. Of course I normally specialize in Human Beings, but every Being is a Being, so I might as well give it a try. And very often the dog (or cat, or horse) improves and develops new positive behaviour afterwards. 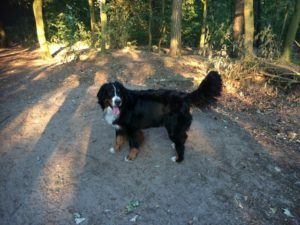 This week I met Senna a Bernese Mountain dog. Her name’s the same as my own black Labrador so I loved her instantly. Senna was replaced with her new family just a few weeks back and really was the sweetest thing. After a few minutes in which she was a bit anxious she wanted to cuddle and sit on my lap! 34 kg of dog crawling all over me, hugging and licking and sitting on my lap while I cuddled and tried to do my ‘job’. Afterwards I was covered with water (she stepped into her water bowl and splashed all over me), sand, leaves and dog kisses and after we had walked in the forest with the two Senna’s and cuddled some more, it was time to say goodbye again. Needless to say that I hope she’ll be doing very well.